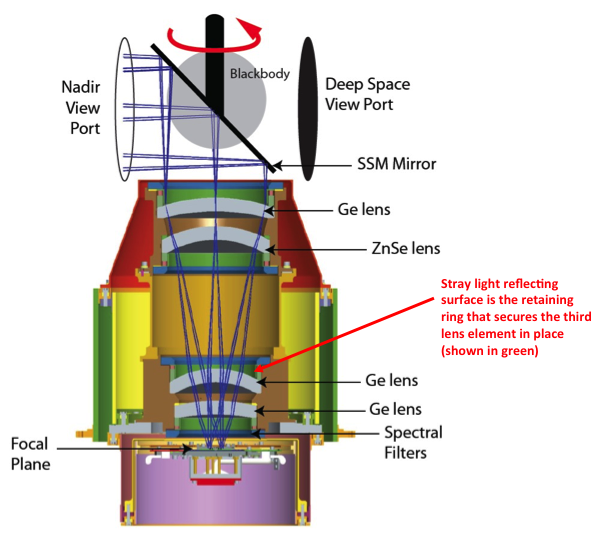 The “ghost-maker” was the metal alloy retaining ring just above the TIRS telescope’s third lens. Oct 31, 2017 • In the giddy, early days following the flawless launch of Landsat 8 as the satellite commissioning was taking place, the calibration team noticed something strange. 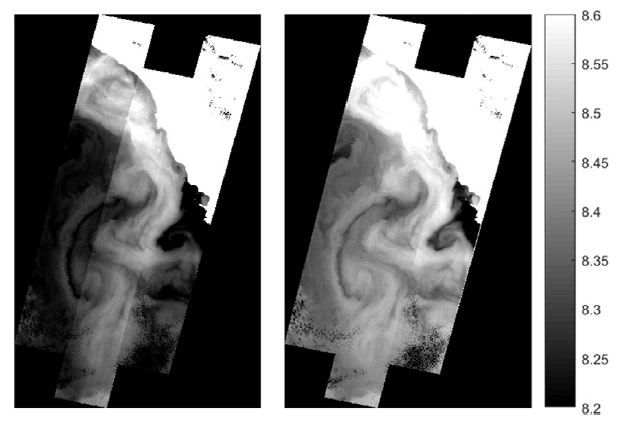 Light and dark stripes were showing up in images acquired by the satellite’s Thermal Infrared Sensor, or TIRS, instrument. Comparing coincident data collected by Landsat 8 and Landsat 7—taken as Landsat 8 under flew Landsat 7 as it made its way into its final orbit—showed that thermal data collected by Landsat 8 was off by several degrees. The TIRS sensor had been added to the Landsat 8 payload specifically because it had been deemed essential to a number of applications, especially water management in the U.S’s arid western states. The TIRS error source was a mystery. The prelaunch TIRS testing in the lab had shown highly accurate data (to within 1 K); and on-orbit internal calibration measurements (measurements taken of an onboard light source with a known temperature) were just as good as they had been in the lab. But when TIRS radiance measurements were compared to ground-based measurements, errors were undeniably present. Everywhere TIRS was reporting temperatures that were warmer than they should have been, with the error at its worst in regions with extreme temperatures like Antarctica. After a yearlong investigation, the TIRS team found the problem. Stray light from outside the TIRS field-of-view was contaminating the image. The stray light was adding signal to the TIRS images that should not have been there—a “ghost signal” had been found. Scans of the moon (conducted by the Landsat 8 flight operations team) together with ray tracing models created with a spare telescope by the TIRS instrument team, identified the stray light culprit. A metal alloy retaining ring mounted just above the third lens of the four-lens refractive TIRS telescope was bouncing out-of-field reflections onto the TIRS focal plane. The ghost-maker had been found. With the source of the TIRS ghosts discovered, Matthew Montanaro and Aaron Gerace, two thermal imaging experts from the Rochester Institute of Technology, were tasked with getting rid of them. Montanaro and Gerace had to first figure out how much energy or “noise” the ghost signals were adding to the TIRS measurements. To do this, a stray light optical model was created using reverse ray traces for each TIRS detector. This essentially gave Montanaro and Gerace a “map” of ghost signals. Because TIRS has 1,920 detectors, each in a slightly different position, it wasn’t just one ghost signal they had to deal with— it was a gaggle of ghost signals. To calculate the ghost signal contamination for each detector, they compared TIRS radiance data to a known “correct” top of atmosphere radiance value (specifically, MODIS radiance measurements made during the Landsat 8 / Terra underflight period in March 2013). Differencing the MODIS and TIRS measurements showed how much energy the ghost signal was adding to the TIRS radiance measurements. These actual ghost signal values were compared to the model-based ghost signal values that Montanaro and Gerace had calculated using their stray light maps and out-of-field radiance values from TIRS interval data (data collected just above and below a given scene along the Landsat 8 orbital track). Using the relationships established by these comparisons, Montanaro and Gerace came up with generic equations that could be used to calculate the ghost signal for each TIRS detector. Once the ghost signal value is calculated for each pixel, that value can be subtracted from the measured radiance to get a stray-light corrected radiance, i.e. an accurate radiance. This algorithm has become known as the “TIRS-on-TIRS” correction. After performing this correction, the absolute error can be reduced from roughly 9 K to 1 K and the image banding, that visible vestige of the ghost signal, largely disappears. “The stray light issue is very complex and it took years of investigation to determine a suitable solution,” Montanaro said. This work paid off. Their correction—hailed as “innovative” by the Landsat 8 Project Scientist, Jim Irons—has withstood the scrutiny of the Landsat Science Team. And Montanaro and Gerace’s “exorcism” has now placed the Landsat 8 thermal bands in-line with the accuracy of the previous (ghost-free) Landsat thermal instruments. USGS EROS has now operationally implemented the software fix developed by these “Landsat Ghostbusters” as part of the Landsat Collection 1 data product. Savvy programmers at USGS, led by Tim Beckmann, made it possible to turn the complex de-ghosting calculations into a computationally reasonable fix that can be done for the 700+ scenes collected by Landsat 8 each day. “EROS was able to streamline the process so that although there are many calculations, the overall additional processing time is negligible for each Landsat scene,” Montanaro explained. Gerace is now determining if an atmospheric correction based on measurements made by the two TIRS bands, a technique known as a split window atmospheric correction, can be developed with the corrected TIRS data. Meanwhile, Montanaro has been asked to support the instrument team building the Thermal Infrared Sensor 2 that will fly on Landsat 9. A hardware fix for TIRS-2 is planned. Baffles will be placed within the telescope to block the stray light that haunted the Landsat 8 TIRS. The Landsat future is looking ghost-free. Barsi JA, Schott JR, Hook SJ, Raqueno NG, Markham BL, Radocinski RG. 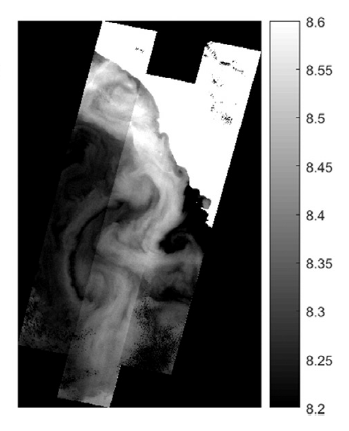 (2014) Landsat-8 Thermal Infrared Sensor (TIRS) Vicarious Radiometric Calibration. Remote Sensing, 6(11), 11607-11626. Gerace, A. D., Montanaro, M., Connal, R. (2017). 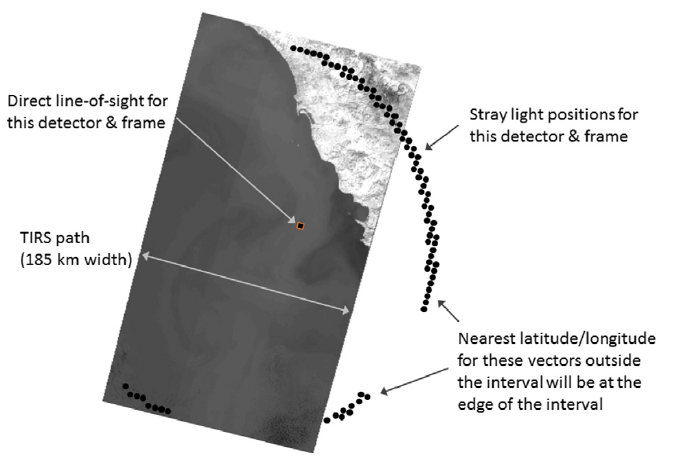 Leveraging intercalibration techniques to support stray-light removal from Landsat 8 Thermal Infrared Sensor data. Journal of Applied Remote Sensing, Accepted for Publication. This entry is filed under Data, News, Science Brief, Technical News.